When it comes to flower garden design, it's mostly up to you. Sure, it's important to do a good job of soil preparation and carefully match plants to the site. If you ignore these imperatives, your results will likely be disappointing. The aesthetics, however, are more a matter of personal preference. You might prefer a formal look with straight edged beds and plants in orderly patterns. Or you might prefer a more natural look with sweeping curves and irregular clumps of plants. The styles you choose are up to you. The tips below avoid as much as possible the prescriptive "shoulds" that dominate advice about garden design. Instead, they'll point out the aesthetic consequences of different strategies. Remember that, in most cases, there is more than one way to arrange plants, and that many of the "rules" of garden design were made to be broken. What's important is that your garden look good to you. Break this rule at your own peril. Different plants need different amounts of light. Most candidates for flower gardens prefer full sun (6 or more hours of direct sun each day). Others need full- or part-shade. Some plants may grow fine in the shade but flower better in full sun. See Flower Growing Guides for more information on sunlight requirements of each kind of flower. This is the other unbreakable rule. Most garden plants need well-drained soil. Unless you are going to limit yourself to plants that can tolerate boggy soil conditions, avoid locating flower gardens where there is standing water after heavy rains or during the spring thaw. Prepare soil well in advance of planting -- preferably in fall for planting the following spring. Plant flower beds where you can see them. Especially consider the views from private outdoor spaces such as patios, decks, and terraces. Don't forget about how the beds will look when viewed through windows from inside the house. Also consider how neighbors and passersby will see your gardens. 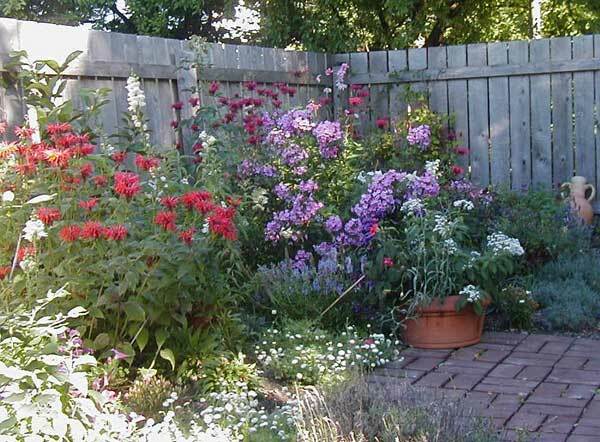 One of the most tempting places to put your flower garden is around the base of a mature tree. This is one of the most difficult places to grow flowers, however, because of the deep shade and intense competition for moisture and nutrients from tree roots. 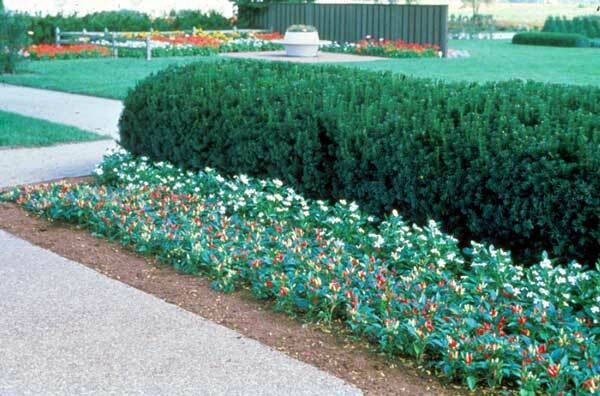 Very few plants will thrive here -- with the exception of some tough, competitive groundcovers. Now might be a good time to start sketching your design plans on paper. Start with the footprint of your house. Add the garage, other buildings, driveway, walks, fences, and patios. Sketch in existing trees and other plantings. Indicate which way is north on your sketch so that you become more aware of how much sun different places receive. For example, areas close to the north sides of buildings get little direct sun. Flower gardens are easiest to establish on level or slightly sloping ground. Steep slopes pose special problems, especially protecting soil from erosion. They may require terracing if you want to create flowerbeds without losing soil. Such slopes might also be good candidates for a tough, spreading, mat-forming groundcover. 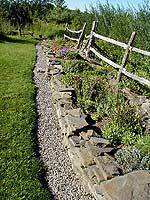 Some steep slopes might be ideal sites for rock gardens. Indicate steep slopes on your sketch. Many homes are girdled by often-overgrown evergreen shrubs. With older homes, the purpose of these plantings was to hide ugly foundations and basement windows. Most newer homes lack ugly foundations, but many still sport the shrubs -- more out of tradition than anything else. Consider removing some of these shrubs and using the space occupied by foundation plantings for flower beds or mixed plantings, or creating beds in front of the shrubs. Returning to your sketch, look for likely spots for creating new flower beds. These may be border beds, tied along one edge to a building, fence, or walkway. Or they may be island beds, carved out of the middle of the lawn. Before you pencil in potential bed locations, consider the background. Most plantings benefit from a background to provide some visual contrast to the plants. Buildings, fences, hedges, or a row of evergreen trees can keep the plants from just melting into the existing landscape. Growing vines on a fence can give that background an interesting texture. With island beds, larger plants in the center of the bed can provide a background for other plants. One caution: Solid backgrounds can restrict airflow and increase disease problems if plants are spaced too close together. 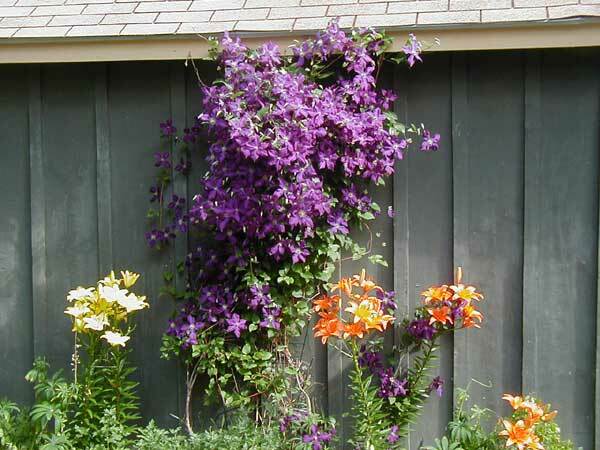 In a small yard with limited space, 2- to 3-foot-wide borders may make the most sense. The rule of thumb for traditional English perennial borders is that they need to be at least 6 to 8 feet wide to accommodate the range of plants needed to provide varying heights and continuous bloom. (If shrubs are used as a background at the rear of the bed, allow at least two feet between them and the perennials for good airflow and access for maintenance.) If the cottage gardening bug bites you, you might find your beds expanding to take up most if not all of the yard, with just a few footpaths or stepping stones winding through. But you need not feel restricted by either of these traditional garden styles. Feel free to try the range of options that fall between these two. The beds in formal gardens usually have straight edges that are easier to maintain. But some gardeners find these dull. Gently curving edges provide a less formal look and give the bed the illusion that it is longer than it really is. At the other end of the spectrum, sharply scalloped edges are harder to maintain and mow around. Some gardeners find such complicated edges distracting. Use a garden hose to mark the edge of your bed before you create it. It's not a bad idea to leave it in place for a few days to give you time to work around it, view it from different angles while envisioning the plants, and adjusting the boundary. You can also mark the edge with flour, lime, or landscape paint. Pencil beds into your sketch. Plan to maintain the boundary between lawn and flowerbed by edging with a flat spade, half-moon edger, or weed-trimmer. You can also work a variety of edging materials into your plan, including products made from metal or plastic, bricks, field stones, or pavers. Now it's time to start sketching which plants might go where in your beds. Most gardeners arrange plants in beds with the tallest plants in the rear and the smallest toward the front. If you are designing a bed to be viewed from a window, this might mean having the shorter plants closer to the house. 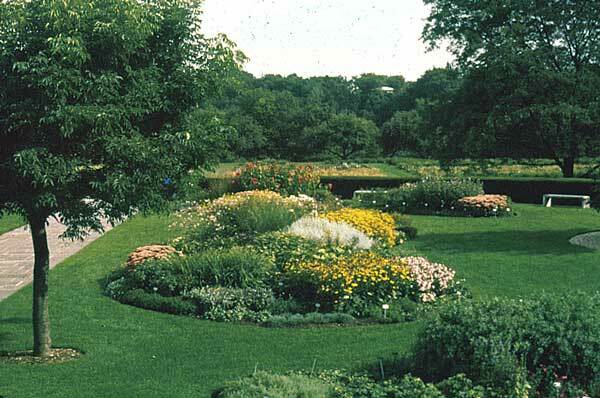 Similarly, island beds usually have tall plants in the center and smaller plants toward the edges. A general plan might include plants that are less than 1 foot tall in the front third of the bed, plants that are greater than 3 feet tall in the rear third of the bed, and plants between 1 and 3 feet tall in the center third of the bed. 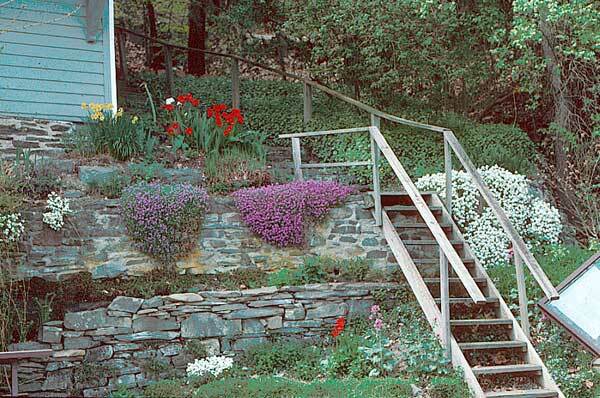 Don't adhere to these guidelines too rigidly unless you want your garden to look like stair steps in profile. You can bring some of the taller plants forward and plant some of the shorter plants farther back to create a more varied topography. To create a smooth gradation of heights, the tallest plants should be no taller than about two-thirds the width of the bed, or half the width of the bed in the case of island beds. Spectacular blooms grab our attention, but don't ignore the rest of the plant in your planning. Many plants have foliage that adds color and interesting visual textures to the garden. [See Flower Gardens: Texture.] Plants also come in a variety of shapes (also called form or habit). Some plants grow into cushions, mounds, or clumps. Others are upright and spiky. Still others are round and bushy. Some gardeners mix these different forms in close proximity for a varied effect. Others group plants with similar forms together. 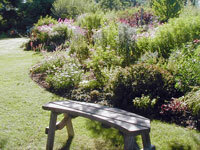 In formal gardens, plants are usually arranged in rows or other regular patterns. In informal gardens, they can be in clumps (a circular group of three or more plants) or drifts (an elongated grouping of plants). Clumps and drifts are most often planted with an odd number of the same kind of plant to give the appearance of a more natural grouping. Planting groups of the same kind of plant in clumps or drifts provides more visual impact than planting a single plant, unless the plant is large enough and spectacular enough to hold interest by itself. (These are called specimen plants.) For example, a single cut-leaf Japanese maple can have a dramatic impact in an ornamental planting. A single zinnia, on the other hand, won't attract much attention. Alternating individual plants with flowers of different colors in a rigid pattern (red, white, red, white ... ) in close proximity can have a jarring effect. Repeating a plant or color in several places along a border, however, can add cohesiveness to a seemingly random planting. Many flower gardeners rely on herbaceous perennials as the backbone for their plantings, using spring-flowering bulbs for early color and annual flowers to fill in gaps. Don't feel limited by such orthodoxy. Many gardeners also incorporate evergreen or flowering shrubs and small trees into their gardens. 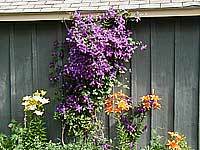 These are especially helpful for providing fall color and winter interest. Ornamental grasses -- from the very tall to the very short -- can provide background, form, texture, and fall and winter interest. Many vegetables and herbs provide a double bonus, being pleasing to both the eye and the palate. You may decide at some point to specialize in a particular type of gardening. 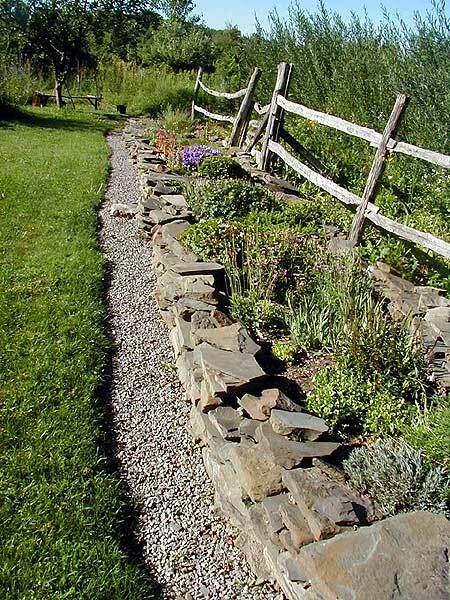 For example, rock gardeners specialize in growing plants (many of them native to alpine regions) that thrive in gravelly, well-drained soils. Other gardeners have particular interest in growing plants that attract butterflies or hummingbirds. Fascinated by particular ecosystems, some gardeners create water gardens, bog gardens, prairie gardens, or woodland gardens. Those focused on different plant uses create herb gardens, fragrance gardens, cut-flower gardens, or edible landscapes. Others create authentic gardens reflecting the traditions of another culture -- the Japanese meditation garden, for example. You may decide to incorporate some or all of these into your own garden, creating your own unique style. After all, that's what gardening is all about. Acknowledgment: Special thanks to Lee Nelson, former Broome County Extension Educator, for some of the design concepts she teaches. Straight lines and regular plant spacing provides a formal look. Curved edges and irregular plant spacing provides a more informal look. Island beds float in the middle of a lawn. 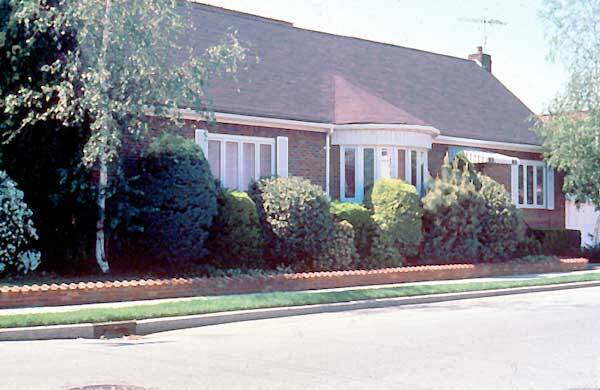 Many homes are girdled by evergreen foundation plantings. 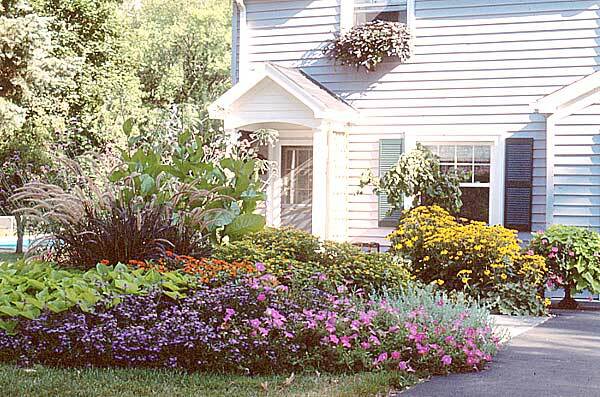 Mixed shrubs and flower beds can provide a different look from traditional foundation and entry plantings. A fence makes a great background that sets off plants in front of it. Turn buildings from a liability into an asset in your landscape by using them as backgrounds for plantings. Small plants work well in narrow beds. 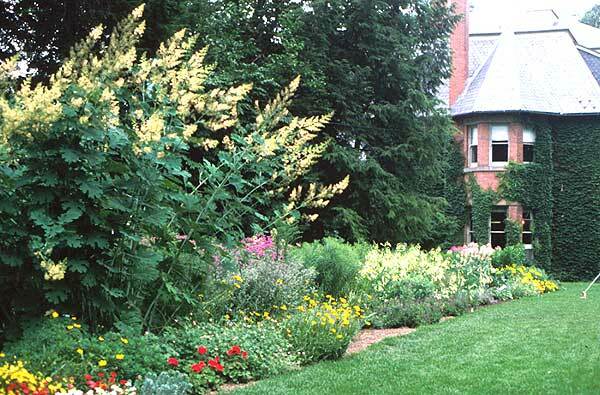 Tall plants can overwhelm border plantings if the beds aren't wide enough.